MRI (Magnetic Resonance Imaging) is a modern imaging technique that uses a strong magnet, radio waves and a computer to generate images, which show detailed sections of the body. These can be acquired in any orientation within the body and can produce images of any specified body part. MRI does not use X-rays and has no known harmful effects. We have two MRI Units. We offer appointments between 7.30 am and 8.00 pm. This flexibility offers patients a wide choice of appointment times for their MRI scan. MRI scans are undertakn by experienced radiographers. 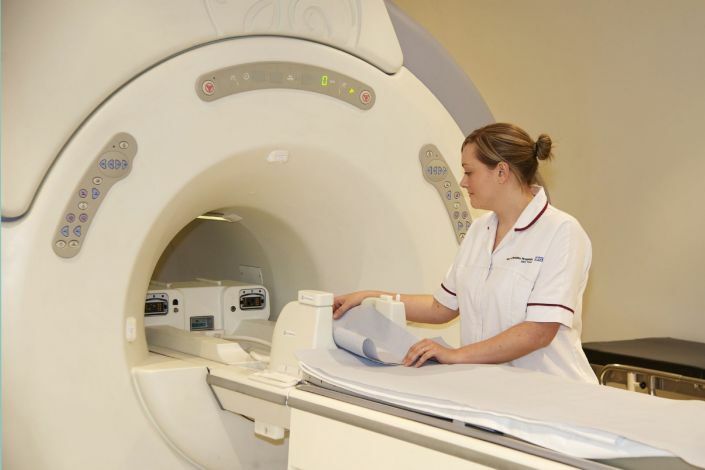 An MRI scan can be performed on patients of all ages and produces images that can depict and locate almost anything from anywhere within the body from a large tumour to a minute blood vessel. An injection of contrast agent (dye) is sometimes required during a scan. MRI cannot be performed on patients with cardiac pacemakers, cerebral aneurysm clips (in the brain). The MRI department needs to be informed if patients have replacement mechanical heart valves, have ever had metal splinters go into their eyes, major head or heart surgery, or orthopaedic implants (such as pins plates, screws in any bones or joints).